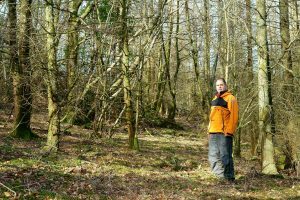 I purchased Snighow Wood, in Wasdale, with the intention of maintaining it as a wildlife habitat; specifically red squirrels. Formerly occupied by red squirrels, greys had moved in some years previously. The timing of my purchase (end of December 2015) was fortunate, as greys had been (largely) removed from the area about a year previously, by the West Lakes Squirrel Initiative. With the choice of three plots of woodland, I chose the one which I thought most suitable for the squirrels, and requiring the least amount of work. There was hazel to be coppiced, rhododendrons to be tackled and paths to be cleared or created! On the positive side, there were at least a dozen mature sweet chestnuts, plus numerous pines and larch; all species with seeds loved by red squirrels. Working three hours a month, I was on top of the tasks by the autumn; brashing conifers to assist squirrels in making a rapid ascent, in case of danger, and generally ‘thinking like a squirrel’ in terms of what was pruned/felled and what was left standing. Many fallen trees were left in situ, as were a couple of leaning, but ‘hung-up’ birches. Experience has taught me that these make excellent ‘squirrel highways’. 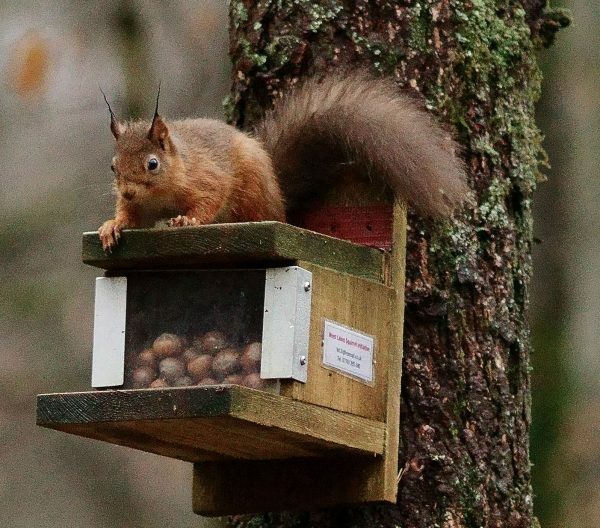 Late September saw my first red squirrel sighting, on a feeder set up in July. 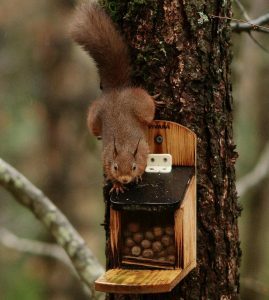 A second feeder went up in October, but then came the sad news of a red squirrel being run over on the nearby road. Hazelnuts (possibly the favourite food of the red squirrel) continued to vanish from the feeders, but I had no further sightings for weeks. Deer, owls and birds of prey also visited the wood, mainly unseen. Early December saw a different red squirrel appear and, after four greys were removed, two reds were seen (actually minutes after two of the greys were shot). Early January 2017 saw me photographing two reds in the wood. Interestingly, one squirrel was using the slim poles of felled birch trees, which I had used to mark the edge of one path, as his ‘highway’. Claws on a solid surface generate more forward momentum than claws in springy turf. So, things are working out well, and I hope to take other photographers into my wood during the coming months. Where is your wood, Allan? How did the grey squirrel arrive in the UK?